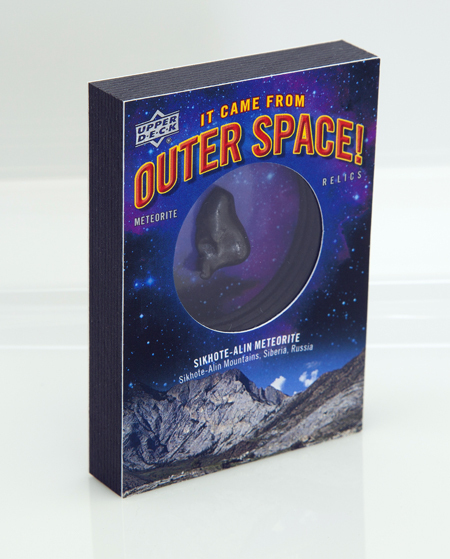 One of the surprises of the 2012 Goodwin Champions set were the “It Came From Space!” meteorite insert cards. And we have added another ten cards to the 2013 Goodwin Champions set to continue the series on for this season. They were recently completed and we will be ready to ship soon for collectors who submitted redemption requests for them. Given how thick some of these cards are, they could not be inserted into packs and are only available via redemption trade cards that were inserted into the product. Two key new additions to this year’s set include samples of meteorites that crashed into the Earth from the Moon and Mars. Ten new cards are available in the 2013 Goodwin Champions “It Came From Space!” insert set. Actual meteorite samples are housed within the cards. Each card is very thick and can actually stand on their own. 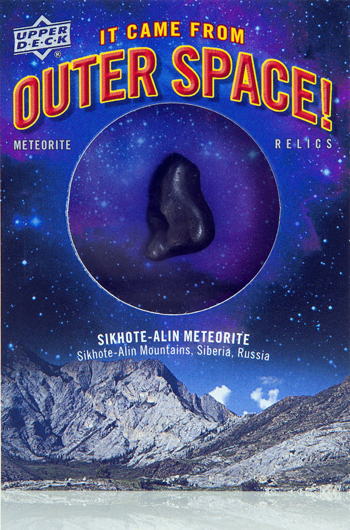 Worthy of note, Upper Deck did not produce an “It Came From Space!” meteorite card from the recent fragment that fell in Russia this winter. Given the amount of destruction that meteorite caused, we felt it would be inappropriate to produce a card with samples of that meteorite at this time. The video on that meteorite falling from the sky is remarkable to say the least, but also very scary considering it fell in such a populated area near Chelyabinsk. Never heard of these…how do you get these cards? I mean what product are the redemption cards placed in? ?